Ready for the road in our Cruisemaster. 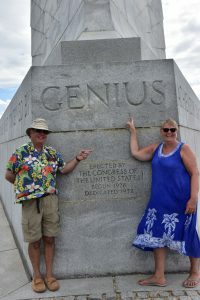 While we might still be considered newbies in a number of ways, with much more to learn on our overlandish odyssey, Betty & I have come to a few realizations during our first year of travel as full-time RVers. These learnings are specific to our situation, but some aspects may be generalized for others. That is the purpose of this post. 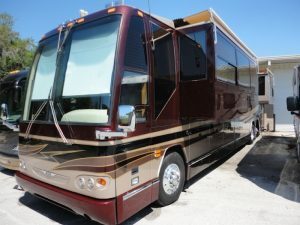 A 1998 Prevost H3-45 motorhome with 2 slides: Looks great inside & out! on our journey. My conclusion – not that of my wife, LOL – was that we needed a 45’ tag axle diesel pusher to get us down the road. My preference was a 12 – 15 year old Prevost H3-45, because of the huge available basement space. While I still look longingly at any Prevost that passes us by, I now realize that would have been the wrong choice for us. Our old Georgie Boy, with Smart car on behind. Our 2005 Georgie Boy CruiseMaster was already paid off before we sold our home, so rather than putting our money into a depreciating asset (more on that later), Betty & I chose to invest in keeping our Boy roadworthy, while adding a few up-to-date bells and whistles. When our 4 kids grew up and moved out, we downsized our home and rented heated and unheated storage lockers for the first year. At that point we realized we had never visited the storage lockers and could therefore easily live without that stuff. So we got rid of the lockers and their contents. 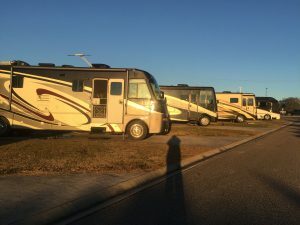 The first few posts to this blog describe the agonizing decisions involved in decluttering as we downsized from a home to a motorhome. It can be a tough process, but very rewarding and liberating in the end! Parked by the Atlantic ocean in Massachusetts. At first, we crammed in whatever we thought we would need for our 5 year adventure. But after our first winter, we realized that we were carrying around more stuff than we were likely to use on the next leg of our journey. We have learned, confirmed by a number of other full-timers, that renting storage lockers is a waste of money, despite the fact they are everywhere we go on our travels! Our reality is that we are cheating a little bit by still keeping a bunch of “stuff” in the corner of our son’s basement. But we are committed to going through all that next summer, and deciding on a better home for those former treasures. BTW, Betty & I realize that the heartbreaking exercise of getting rid of our worldly possessions gets passed on to our children when we die, so if we can help dispose of a few things now, it lifts the burden for them later: a worthwhile exercise! Staying at a KOA in Montgomery, Texas for an FMCA rally. posts to see what we’re talking about. Many parks are nestled in forests, precariously close to rugged cliffs, or near the sound of crashing waves. They cannot accommodate 45’ diesel pushers, and knocking down the trees and leveling the rugged terrain would take away from the natural beauty of these spots. In many parks, 35’ is the maximum permitted length, so those beautiful parks are not an option for a longer rig. Heading into a scenic look-out on the Cabot Trail. Larger RVs also cannot be accommodated in many scenic road-side pull offs. 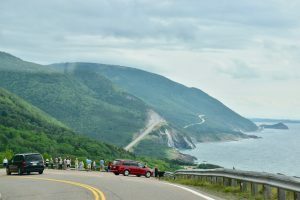 For instance, we drove the Cabot Trail (Aug. 16/18 post: The Majestic Cabot Trail) in our Smart car, stopping to take a closer look at amazing views along the way. Since motorhomes would not fit in most of these scenic look-outs, drivers and their passengers were forced to sail by and miss out on their trip’s raison d’être. In the belly of the beast for one of our ferry rides. Also, the bigger the RV, the more it weighs and the more gas required to move it down the road. 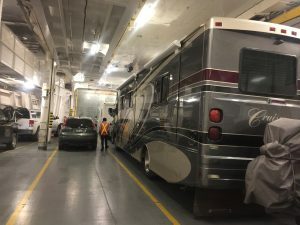 Ferries usually charge by the foot after a certain length, and some smaller ferries have a limit to the size of RV they can accommodate. Toll roads often charge by the number of axles on a vehicle, and some parking lots and rest areas simply don’t have room for larger vehicles. While the cost of gas, tolls etc. may not be prohibitive for short trips, it can add up substantially over time, taking away funds that could be better spent elsewhere. The more Betty & I travel, the more we realize that we can live without a lot of extra baggage. Our focus these days is more on what we can get rid of, rather than what we can accumulate. Living in a smaller RV, we can ignore all the TV and magazine ads enticing us to buy a bigger this or that. 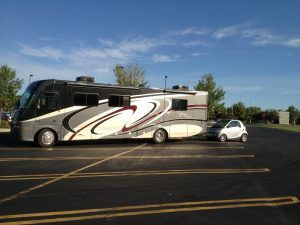 When we realize we can be content with less, we are liberated from carrying lots of stuff in a larger motorhome. For us, bigger is definitely not better! 2. We Should Slow Down! In mapping out our 5 year travel plan to visit 48 states and 10 provinces, I thought I was being conservative in limiting travel days to 3 ½ – 4 hours: breaking camp between 10:30 – 11:00 am, stopping for lunch between noon and 1:30 pm, and setting up at our new location between 3:30 – 4:00 pm. That part of the schedule has worked out quite well in our first year. However, we have already visited more than half the states and provinces, because often I only allowed one or two days for each stop. 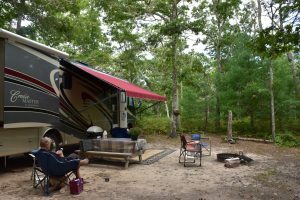 That meant that we were usually more focused on grocery shopping and getting ready to leave, than on enjoying the surroundings at our campground. 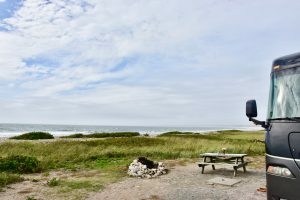 Spending a week in our unserviced site at Linkletter Provincial Park on PEI included 120′ of shoreline. We learned that this overlandish odyssey is not a race, and we should slow down and smell the roses a little more along the way. Why do we need to get up and move so often? Unless there is a hurricane or tornado coming in, we hope to spend a little more time at some of the nicer locations we unexpectedly encounter. 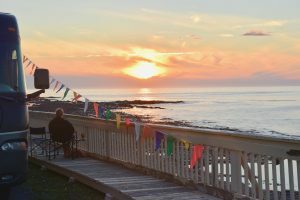 As an example, we only intended to spend 5 days on Prince Edward Island, but after we got there and fell in love with the laid back beauty, we spent at least 2 weeks enjoying just a fraction of what the island has to offer. In future, we hope to return to places like that and spend longer periods soaking up the ambiance and scenery. Sunset over the St. Lawrence at our free camping spot in Pointe-a-la Frigate. 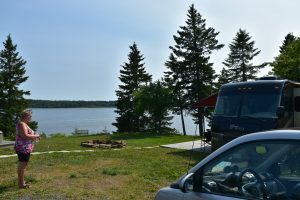 Our very welcoming free Boondockers Welcome site on the Miramichi River in New Brunswick. power. Earlier posts note stays in Walmart and Cracker Barrel parking lots, and wonderful visits through Boondockers Welcome and Harvest Host. Bureau of Land Management (BLM) campsites are a great find, as are the many free camping web sites listed on the Internet. Almost none of them offer shore power, but if you have solar panels, it is possible to dry camp for free or cheap across the continent. 2 x 250w solar panels on our roof absorb the Arizona sun. Some camp spots allow generators, and we have used ours from time to time, but there is nothing better than quietly sitting outside in nature, knowing that you are not disturbing your neighbours, near or far. 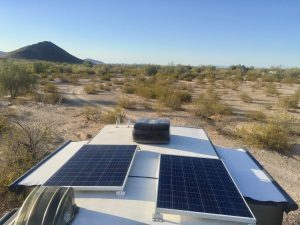 The initial cost of a solar system may be high, but Betty & I believe it pays for itself by reducing campground fees, while liberating us to consider other camping options. Related to this, and tied to the point above about slowing down: We have found it better not to make reservations all along our route. If we do, we feel obligated to move along in order to prevent a cancellation fee. Reservations constrain us from staying longer at beautiful spots we unexpectedly encounter. 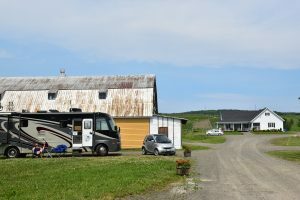 Free Harvest Host camping at Domaine L’Ange Gardien winery near Quebec City. Having said that, there are times when we have a particular event or place on our bucket list, and the only way to ensure a campsite is to make a reservation. For example, some of our kids and grandkids are meeting us in Florida in February for a Disney visit. Their vacation schedule is fixed, so our campground reservations are required to ensure we can enjoy the time together. One of the most unique spots in North America to dry camp is Quartzsite, Arizona. We spent 2 weeks there last winter (see March 24/18: Quartzsite & Controlling The Sun, & March 27/18: A Desert Oasis) for a total of $40. That allowed us to camp anywhere on BLM land, fill up with fresh water as required, and use their dump station. We learned from others at Quartzsite that it is possible to save considerably on accommodation costs and apply those funds for other uses. Next winter we are thinking of spending more time there, in order to explore a variety of other options. 4. A New RV Is Not Necessarily A Better RV: For years advertisers have promoted almost everything as “new and improved”. We have learned that, when it comes to RVs, new is not necessarily improved. For one thing, as earlier mentioned, motorhomes are a depreciating asset. 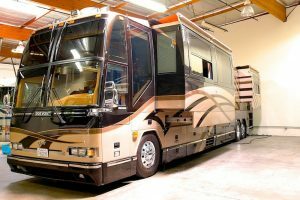 A 2000 Prevost H3-45 with 2 slides. While I would love to be in a position to own a brand new Prevost bus conversion by Marathon, the average cost is around $1,700,000 plus or minus a few hundred thousand. It becomes used and depreciates as soon as you drive it off the lot, losing about $100,000 in value for each of its first 10 years. That’s a million dollars in depreciation! If you can afford that, good for you! After that, it drops in value by only about $75,000/year, and levels off at around $50,000/year after 13 – 15 years. These coaches are extremely well made and designed to carry large passenger loads safely over long distances. 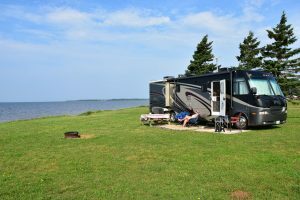 They are a much more sturdy construction than fiberglass motorhomes built for 2 people, and like many high end vehicles, they don’t change appearance every year. Unless one is very familiar with model nuances, it is difficult to guess a 1998 model from a 2008, or even a 2018 for that matter. They are built well, and built to last, but cost a lot to repair, if you can find a shop that will do it. 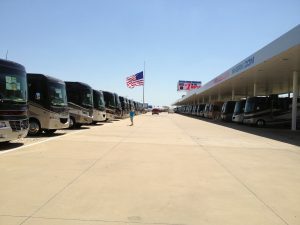 Motorhome Specialist in Alvarado, Texas has a huge selection of coaches. 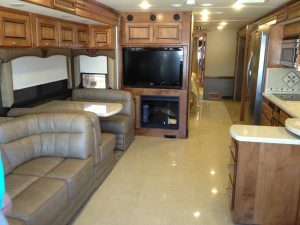 High end fiberglass motorhomes, selling for say $600,000, also depreciate significantly when driven off the lot, losing as much as $100,000/year in value for the first few years. 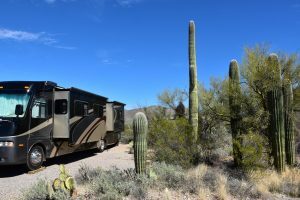 At the same time, warrantees are often limited to only a year or two, and many motorhome dealers will not service your rig if you bought it somewhere else. That is a real problem if you are travelling the continent. This Entegra came with a 2 year warranty. 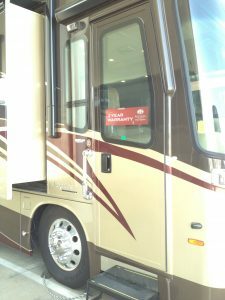 In touring the manufacturing plants of Elkhart, Indiana we learned, as have many others, that most motorhomes are cranked out as fast as possible on assembly lines that have little or no focus on quality control. That is an unbelievable statement when one is considering investing six figures in a vehicle, either as a home or for pleasure! When I mentioned during a tour that the black tank rinse valve has never worked in our rig since new, I was told that it was likely installed backwards, as both ends look similar. Who is checking to see that installed items really work? The interior of an Entegra motorhome, as seen in 2013. For me, listening to promotional advertising that says “New for this year is…” should be a red flag. What it means is that item either didn’t work last year, and they are trying to fix it, or they are incorporating something that isn’t tried and true. The old saying “If it ain’t broke, don’t fix it” applies here. Changing the shape of the headlights, just for the sake of change, means that you will have difficulty sourcing those headlights two years from now, when you need replacements. Parked among the cacti in Tucson, Arizona. 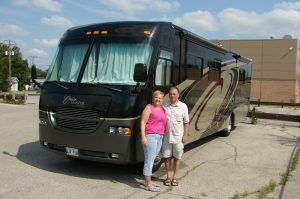 Betty & I learned that it takes a couple of years to work all the bugs out of a new motorhome. (BTW, we did buy our Boy new, and drove it to Alaska in our first year. LOL). 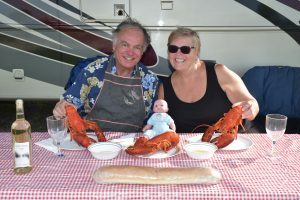 One of our RV plant tour guides told us that it is best not to go too far afield in the first year, because there are going to be a lot of big and little adjustments required. A number of the motorhome magazines we receive have recall pages that list dozens of reasons why new and used RVs need to go back for servicing. 5. Smaller RV Service Centres Often Provide Better Service: As noted in previous posts, all motorhomes need regular service, either for maintenance or emergency repairs. (see April 17/18: Sweetness & Light;July 5/18: Heidi RV Rocks/ Hitch House not so much…;Sept. 22/18: Disillusioned With Camping World, Inspired by Major’s RV, and Sept. 26: Oh, oh!) I won’t repeat all that now, and encourage the reader to check these posts. Suffice to say that, while Camping World in the U.S. was our go-to destination for repairs over the past decade, we have learned that smaller independent RV service centres can and do provide better service. We still haven’t learned how best to differentiate the good from the bad (not all web sites can be believed…), but over time we hope to establish a list of trustworthy repair shops that can keep us going down the road. In the meantime, word of mouth from other RVers and campground hosts can be most helpful. 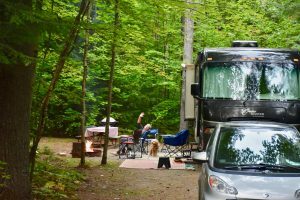 Our campsite at Quechee State Park in Vermont was surrounded by beautiful tall trees. 6. Some Routines Are Helpful, As We Get Older (LOL): Betty & I have developed a number of habits over the past year. Most of them are quite helpful! We have learned that it is good to prepare to leave a campsite in a certain order (make sure our power steps are up before the levelers come up, for instance), and to set up camp in a certain order (put the levelers down before extending the slide-outs, for instance). While travelling, we also routinely listen to audio books to make the time pass, and map out possible rest stops along the way. We learned early –from our parents- that it is good to have a place for everything, and to put everything back in its place. While our home on wheels may be small, it’s surprising how much time we can spend looking for something that was stored in a different location. I won’t bore you with our other routines – suffice to say that memory isn’t always what it used to be – so following patterns can prevent mishaps. 7. We Learned We Still Enjoy Each Other’s Company: Whether or not this learning is generalizable, Betty & I have found that we love to share these adventures together! We have met folks along the way who have lost their spouses. And while they continue to soldier on, it just seems way more lonely to watch that magnificent sunset by yourself, rather than together with someone you love and care about. We both have hobbies and times that allow us to be alone, but this overlandish odyssey has created a series of great memories (so far, LOL) together: A great bonding experience! Well, I’m sure we’ve learned more than seven things in the past year of full-timing, but maybe that’s enough for now. I am far beyond the 600 words targeted for these posts, but far short of the book that could be written about our jaunting journey –even if we are only one year in… So we’ll sign off with these words of encouragement: There are wonderful, interesting people all across our continent, and it is fun to connect and reconnect with them. If you are one of those we’ve met during our adventures, thanks for taking the time to talk with us and share your learnings. Best wishes on your future travels! 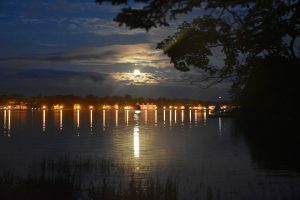 The moon rises through the clouds over Shelburne, Nova Scotia on our first night at The Islands Provincial Park. 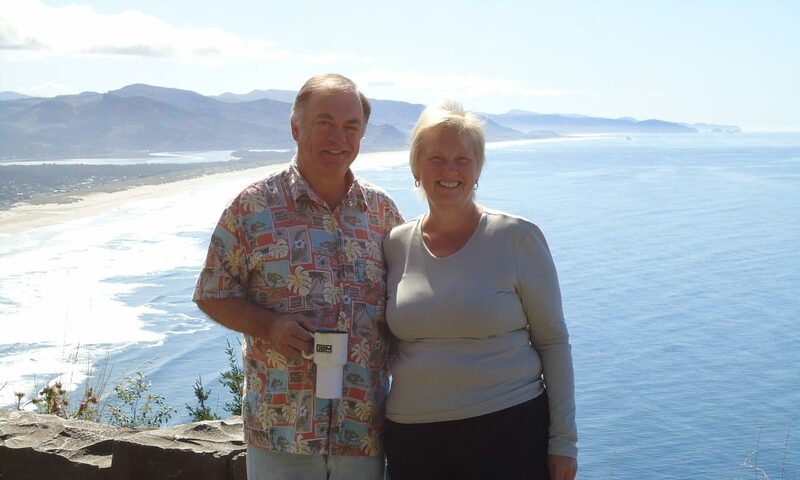 It’s great to share that view with someone you love!